It is one of the best and most secure ways to make sure that the data is not only kept in the memory card but it is also accessed when it is required. The memory cards are a very secure way to make sure that the needful is done in a manner that exhibits quality and class. In today’s era the memory cards are mainly used to make sure that not only the cams and the related snaps are saved but the mobile phone users also make sure that the memory cards are used to keep the entertainment and the apps of the mobile all in one place. To get the best results it is advised to make sure that the memory cards are not only kept safe and secure from dust but they are also saved from direct exposure to the sunlight. There are tens of thousands of free memory card recovery software programs that make sure that the issue of data recovery is resolved as soon as possible but the need of the hour is to make sure that the problem is never faced in this regard and the user gets the best results. Wondershare Data Recovery and Wondershare Data Recovery for Mac is one such program which makes sure that the user gets the best results and recovers the data within time and without any hassle. It is also to be noted that the user should make sure that the software should be tried first before the purchasing decision is made and it is therefore necessary to ensure that the steps that are mentioned below are followed. With 550+ format restoration ability the Wondershare Data Recovery is a memory card recovery software program that has surpassed the user’s wish and resultantly it has been proven that the program is one of the best to make sure that the data recovery is no match at all. Step 1. Select the file type. To recover data from memory card, you can go to select the option "All File Types" to start. Step 2. Select location where you lost your file. Go to select the path of "External Removable Device" to scanning your memory card. Step 3: This software will quick scan memory card, if it can't find your files you can go to deep scan. 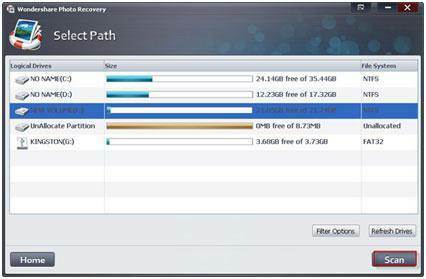 Step 4: After canning, you can preview the recovered data and click "Recover" to save. 1. Human error is one of the major reasons that lead to the issue of data loss on memory card. It can happen with the unsecure data transfer or using the memory card in an absurd manner. 2. Mishandling of the card also leads to issues. It means that the user has taken the card out of the slot while the data was being transferred. 3. The exposure to heat and direct sunlight also makes sure that the issue is faced by the users in this regard. It is therefore advised to store the card in dry place away from the sunlight so that the issue is never faced by the user in this regard. 1. Complete physical damage is one of the most common reasons that lead to the subjected issue. Data is however recoverable with the help of state of the art tools and advanced technologies and the user should make sure that the issue is resolved by taking professional help in this regard to avoid further issues that could be faced. 2. The second reason for which the data is never recovered is due to the fact that it has been overwritten. Again the sophisticated technologies could be used to make sure that the issue is never faced in this regard but still expert advice becomes a must and it should be taken to avoid any loss in this regard. It is also to be noted that there are miscellaneous issues that could also lead to irrecoverable data and for the same reason it is to be noted that the user should visit the online forums and can also post questions in this regard to ensure that the problem is resolved. The online forums is a great place to make sure that the state of the art services are not only enjoyed but the resolutions are also posted within no time at all as there are other people as well who are using these platforms. Data cannot be recovered, why? The software is undoubtedly the best to make sure that the lost data is not only recovered but the user gets the best deals in this regard. In order to make sure that the needful is done the user needs to make sure that the precautionary measures are taken. The foremost and the only measure due to which the issue can happen is the fact that the program has been installed on the same drive from which the data retrieval was required and now it is to be noted that the data has been chocked and cannot be recovered.